CAPE CANAVERAL, Fla. — The six astronauts flying on NASA's final flight of the space shuttle Endeavour are a serious bunch, but they've got a fun streak too. Case in point: The astronauts apparently like the science fiction franchise "Star Trek" enough to re-enact its most recent movie poster. But while past mission posters have recreated the film versions of "Ocean's Eleven" or the Matrix and Harry Potter movies, the six-man STS-134 crew of Endeavour chose something a bit more space-y: the 2009 reboot of "Star Trek," directed by J.J. Abrams. "That was my idea!" Endeavour mission specialist Drew Feustel told SPACE.com. Feustel said he had seen the movie during a previous spaceflight, when he launched on Atlantis in May 2009 to upgrade the Hubble Space Telescope. "That movie came out basically the day we launched and we were fortunate to have that movie uplinked to us on orbit," Feustel said. "I really liked the movie. I thought it was pretty neat." Feustel said he suggested the latest "Star Trek" film as the theme for the STS-134 poster, and the rest of the crew agreed. But Feustel's crewmate Greg Chamitoff remembered it differently. "I kept trying to remember whose idea that was, and I think it might have been mine," Chamitoff said in an interview. Regardless of the origin of the poster idea, the crew seemed to unite behind the concept. "A lot of us are ["Star Trek" fans]," Chamitoff said of the Endeavour astronauts. 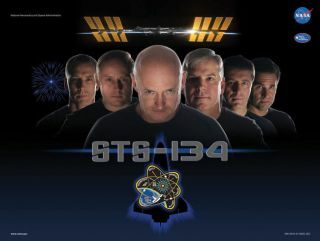 The poster features the six astronauts looking stoically ahead, their faces each in half shadow, with a dark background and "STS-134" in Star Trek font underneath. Leading the crew, in the James T. Kirk position, is Endeavour commander Mark Kelly. "It's a pretty close approximation," Feustel said of the finished product. "It looks pretty cool; we like it." The poster is not the STS-134 crew's only connection to the famous science fiction TV and movie franchise. In May 2005, mission specialist Mike Fincke appeared as an extra during the final episode of the show "Star Trek: Enterprise." He visited the set during vacation, along with fellow astronaut Terry Virts, who also appeared in the episode. Fincke played an NX-01 engineer on the fictional starship. The International Space Station's Expedition 21 crew (the current crew is Expedition 27) also donned Star Trek uniforms for their mission poster in 2009. On Endeavour's last mission before the orbiter is retired, the space shuttle will visit the International Space Station to deliver spare hardware and a new $2 billion astrophysics experiment to search for exotic particles. In an odd side-note, Kelly and Chamitoff also have another movie-themed poster under their belt. Both astronauts were on the crew of NASA's STS-124 flight to the space station in 2008. That crew's choice of a film to emulate: "Harry Potter and the Order of the Phoenix." Kelly commanded that mission on the shuttle Discovery. The mission's new name, according to the poster? "STS-124 and the Order of Discovery."